The ingredient list isn’t particularly informative without one knowing what ‘Mangdana’ might be and the alcohol and propylene glycol are not unusual in essences and commercial extracts. Naturally, I had to do a little research and I discovered that ‘Mang Da’ is, in fact, the Thai name for a particular species of water beetle. Here is a picture of the creature in question, courtesy of Wikipedia. 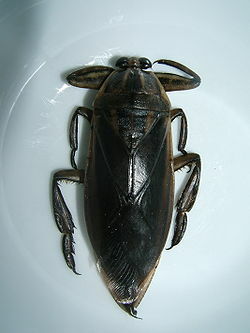 The scientific name is Lethocerus indicus and, although it is difficult to tell from the picture, the bugs can grow up to 4 inches or so in length and are eaten in Thailand and the Philippines. Apparently, the edible portions are sweet and rather like shrimp or scallops in flavor. The extract appears to be a sexual attractant, or pheromone, that the insect secretes in certain liquid-producing sacs. I gather that the real thing is actually very expensive and that most commercial products are synthetic. Despite using the words ‘extract’ on the label, my little bottle cost only a few dollars, so I rather suspect that I may have the synthetic variety. The scent is quite potent and has a very aromatically fruity quality reminiscent of acetone with a background similar to the pith from a banana skin and faint notes of orange peel. The taste, when taken right from the bottle, mirrors all the qualities of the fragrance but at the end there is a slight acrid taste that is a bit like the ash of a wood fire. The essence is meant to be used very sparingly, however (indeed, one use in soup calls for the merest drop one could pick up with the end of a toothpick), and the acrid after-note would not be apparent in such small amounts. From the taste and aroma, I rather would have thought that this product would primarily be used in confectionary, but, in fact, it seems to be chiefly an additive in savory preparations. The soup I mentioned above is a Vietnamese specialty in which various ingredients are cooked in a broth of chicken and dried squid to which a tiny amount of the essence is added. In Thailand, a little is sometimes added to the different chili sauces collectively known as nam phrik , and also to the nuoc cham dipping sauce that accompanied various dishes like rice-paper rolls. I also came across one source that insists the extract is an essential ingredient in Har Gow in Hong Kong (although I confess to never having heard of that anywhere else), and I gather that there is also a Vodka based drink that uses it and has, on occasion, been served with actual bug floating in the glass. Yee..I cannot like this post…weird stuff. Har Gow includes this stuff? Someone spreads the rumor…no such thing! Thank you so much Rabbit! And congratulations on your award! I always learn something new on your blog! I could never use this or taste it willingly. I’m a total coward when it come to insects! I have to say, you are absolutely fearless on this blog. I think it’s so fun! 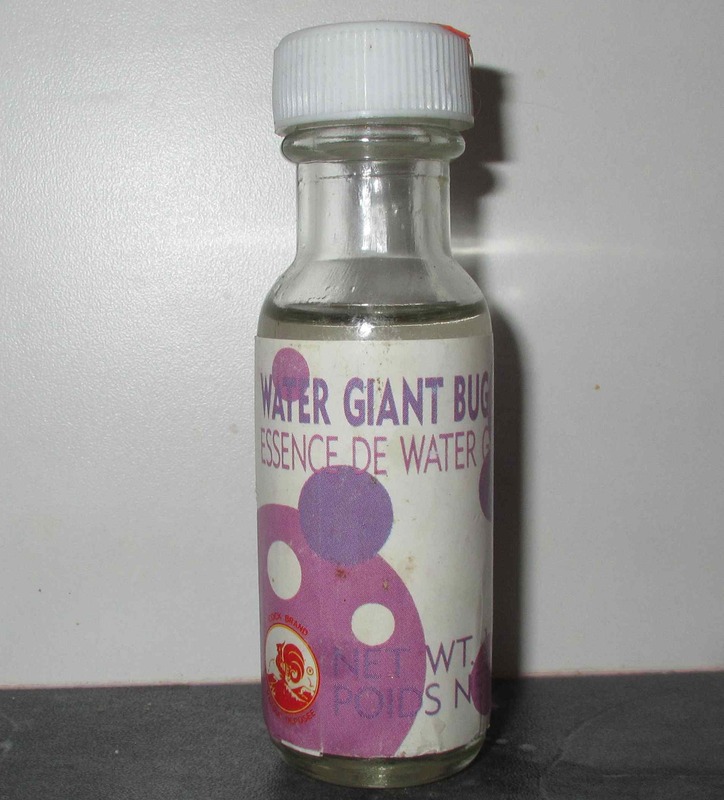 Post about your water bug essence creations soon! Quinn says he is always thrilled to find a few big beetles in his water dish. But, I have to say, good for you! You are getting spiritually fat on life’s buffet! Oh, my gosh, you are so brave!! I couldn’t even give that a little taste after seeing the water beetle in a close up photo!! Now, if I didn’t know.. I’d probably like it, lol! Interesting…but no thank you 😉 A bug essence? I think I’ll keep using the classics: vanilla, almond… I left the experiments to you, because you are so good with them! I like this post, but no, no, no. I can’t think about this essence without shuddering. You are a brave man! I found your blog looking up this very bottle, and I think there were others who were curious about this tantalizing little vial, since there were several abandoned at the cashier! I’m a little disappointed that so little is used, I was hoping I’d found a new flavour for my cooking! Came across your posting. FYI: It’s a true bug and not a beetle. Yes, have had before and also the artificially produced essence. I bought mine in Ottawa. As store on Somerset Street West, Maybe you can find it online. I am interested in trying this. Anyone know where to get it?